Errors caused by invalid synchronization are timing dependent and hard to reproduce. It is common they appear under special conditions (load, hardware) in production. As a software project grows, it gets hard to safely modify the application. A programmer needs global awareness of an applications control flow and data access patterns in order to change the software without introducing errors. 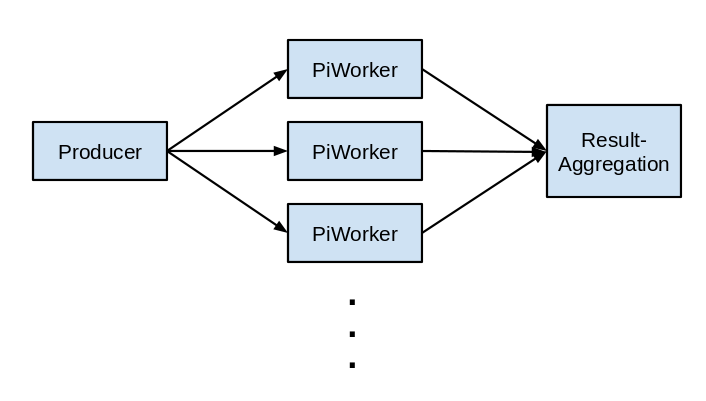 The subtleties of the Java Memory Model are not well known to most Java programmers. Even if JMM is known, incorrect programming isn't obvious and will fail rarely. It can be a nightmare to spot them from production logs of large applications. So I am looking for alternative models to express concurrency. 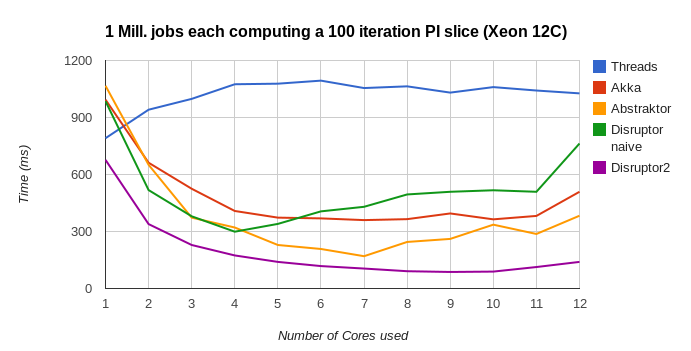 Therefore a simple benchmark of the most popular "alternative" concurrency models is done: Actors, CSP and Disruptor. Real Life Analogy: People cooperating by sending mails to each other. An Actor is like an object instance executed by a single thread. Instead of direct calls to methods, messages are put into the Actors "mailbox" (~queue). The actor single threaded reads and processes messages from the queue sequentially (with exceptions). Internal state is exposed/shared by passing messages (with copied state) to other Actors. 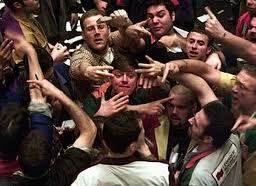 Real Life Analogy: People phoning each other. Though a different terminology is used, CSP systems can be seen as a special actor system having bounded mailboxes (queues) of size 0. 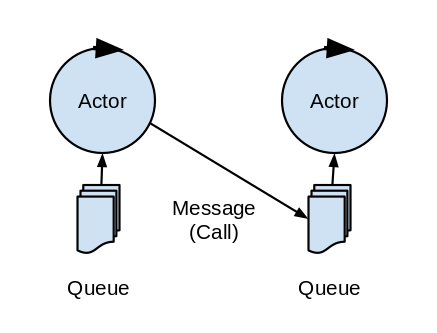 So if one process (~Actor) wants to pass a message to another process, the caller is blocked until the receiver accepts the message. Alternatively to being blocked, a CSP-process can choose to do other things e.g. check for incoming messages (this introduces non determinism to the order of outgoing messages). A receiver cannot accept incoming messages if he is occupied with processing a prior one. The disruptor data structure came up some years ago and was invented and pioneered by Martin Thompson, Mike Barker, and Dave Farley at LMAX exchange. The disruptor is a bounded queue (implemented by a ring buffer) where producers add to the head of the queue (if slots are available, else the producer is blocked). Consumers access the queue at different points, so each consumer has its own read position (cursor) inside the queue. Sequencing is used to manage queue access and processing order. Ok, everybody knows this. Its Java's default to model concurrent execution. Actually these are the primitives (+CAS) used to build higher level concurrent models like those described above. 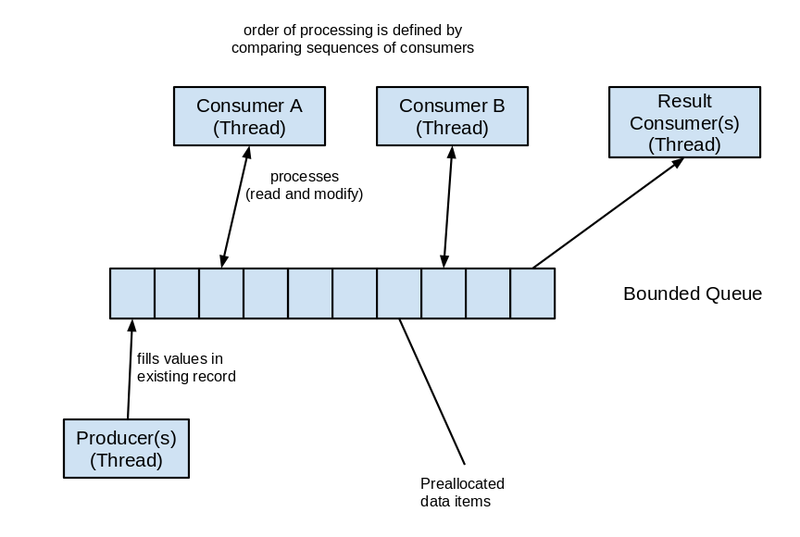 While the CSP/Actor-Model realizes inter-thread communication by passing/copying thread-local data to some queue or process, the Disruptor keeps data in place and assures only one thread (consumer or producer) is owner of a data item (=queue slot) at a time. This model seems to fit existing CPU, memory and VM architectures better resulting in high throughput and superior performance. 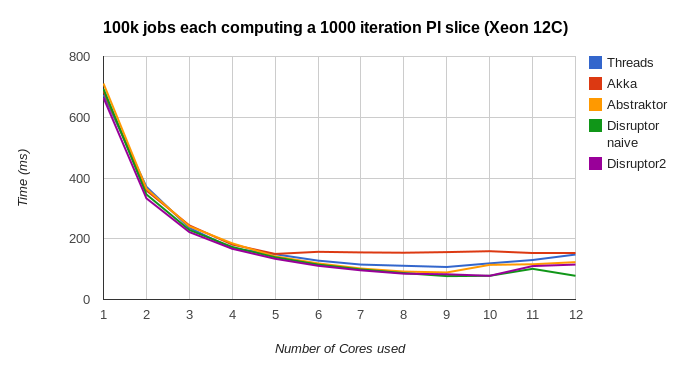 It avoids high allocation rates and reduces the probability of cache misses. Additionally it implicitly balances processing speed of interdependent consumers without growing queues somewhere. There is no silver bullet for concurrent programming, one still has to plan carefully and needs to know what's going on. While I am writing this, I realize each of these patterns has its set of best-fit problem domains, so my initial intention using a single benchmark to compare performance of different concurrency models might be somewhat off :-). Update: Jason Koch implemented a custom executor performing significantly better than the stock JDK executors. See his blog post. The benchmark approximates the value of PI concurrently. Therefore N jobs are created, and the result of each job must be added to finally get an approximation of PI. 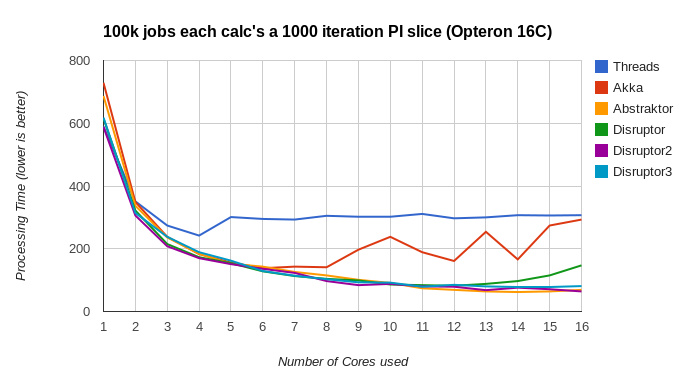 For maximum performance one would create one large job for each Core of the CPU used. With this setup all solutions roughly would perform the same as there is no significant concurrent access and scheduling overhead. overhead created by the concurrency control mechanics (e.g. sending messages/scheduling Runnables to a thread pool, CAS, Locks, volatile r/w ..). I never use more threads as there are "real" cores. Stop the blabber, gimme results ! See bottom of this post for the benchmark source. Threads - somewhat naive thread based implementation of the Pi computation. Enough effort invested it is possible to match any of the other results of course. At the core of the VM, threads, locks (+atomic, volatile r/w + CAS) are the only concurrent primitives. However there is no point in creating an ad-hoc copy of the Disruptor or an Actor system in order to compare concurrency approaches. Akka - a popular Actor implementation on the VM. The benchmark has been reviewed and revised (especially the ActorSystem configuration can make a big difference) by the Akka crew. 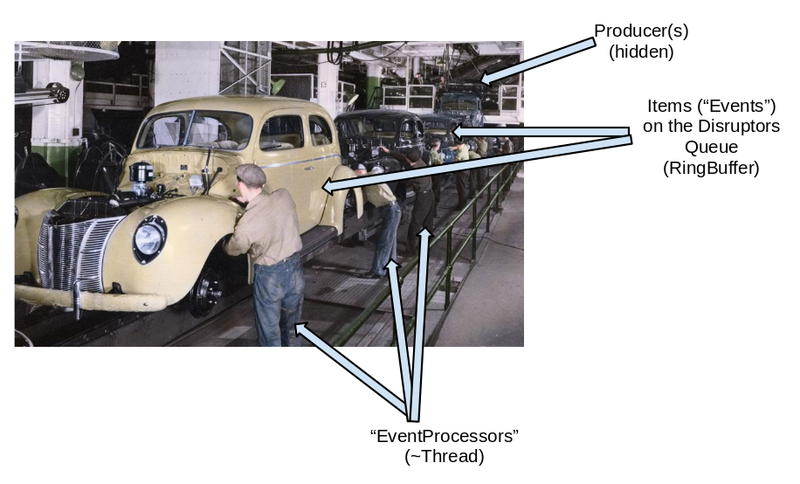 Threads are scheduled using Java 7's fork join pool. Actually the Pi computation is one of Akka's tutorial examples. Abstraktor - my experimental Actor/CSP implementation. It's using short bounded queues (so leans more to the CSP side) and avoids deadlocks by maintaining 2 queues per Actor (in and out). If the out-queue is blocked, it just reads from the in-queue. I am using Nitsan Wakarts excellent MPSC queue implementation (check his blog or github jaq-in-a-box) and that's the major reason it shows kind of competitive performance+scaling. I use this to get a rough baseline for comparision and experiment with different flavours of Actors/CSP. Probably the only thing one can do with it is to run the Pi bench ;-). Disruptor - my naive approach implementing the benchmark based on the Disruptor 3.2. It turned out that I used a not-yet-polished utility class, however I keep this benchmark just to illustrate how smallish differences in implementation may have big consequences. Disruptor2 - As Michael Barker would have implemented it (Thanks :-) ). Its actually more than twice as fast for the 1 million test as the closest runner up. Well, it seems with 100k jobs of 1000 iterations, the benchmark is dominated by computation, not concurrency control. 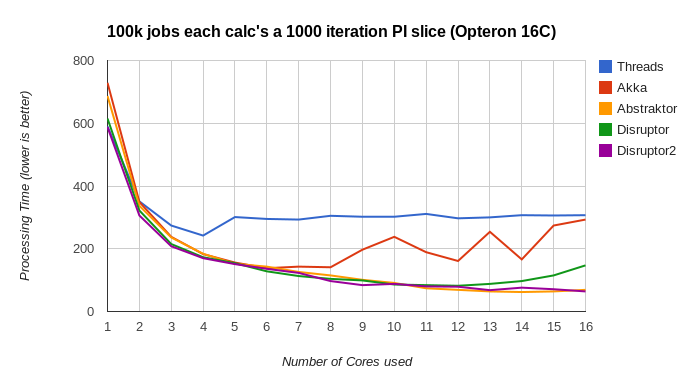 Therefore I retry with 1 million jobs each computing a 100 iteration slice. Note there is like 5% run to run jitter (GC and stuff), however that does not change the big picture. We see that scaling behaviour can be significantly different depending on the hardware platform used. Akka loses a lot of CPU time doing GC and allocation. If I modify Abstraktor to use unbounded Concurrent Linked Queue (Akka uses those), it performs similar to Akka and builds up temporary queues >100k elements. This is an inherent issue of the Actor model. By leaning towards CSP (use very short bounded blocking queues with size <100), performance also suffers, as threads are blocked/spinning for input too often. However with a queue size of 5000 elements, things work out pretty well (introducing other problems like deadlocks in case of cyclic Actor graphs). The Disruptor library is very well implemented, so a good part of the performance advantage could be attributed to the excellent quality of implementation. Couldn't have said it better myself =). Although the Disruptor worked best for this example, I think looking for "the concurrency model to go for" is wrong. If we look at the real world, we see all 4 patterns used dependent on use case. So a broad concurrency library ideally would integrate the assembly-line pattern (~Disruptor), queued messaging (~Actors) and unqueued communication (~CSP).